Every month in the lead up to our 2019 Graduation, ICAN will be featuring the students of its “Indigenous Financial Counselling Mentorship Program” here in our E-News. 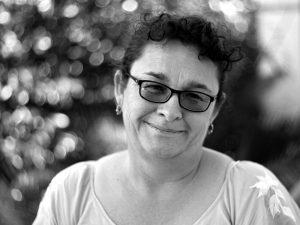 This month, we meet Yvette Lee-Lever, a Gamilaraay/Kamiliaroi woman. Yvette is a Financial Resilience worker with Money Care, Salvation Army in Gatton, Queensland, where for the past 19 months, she has been delivering electricity workshops and the No Interest Loans (NILS) program. What has been your experience so far in taking the Mentorship Program? I’ve done several Diplomas in the past that have been basically all done online, so I suppose it’s the mentorship with everyone in the class. They become your friends and someone you can ring up for advice about a client matter. So, we’ve got that network of support which is a really good thing about this whole program! I think for me it has allowed me to look at things completely differently. I think now I’m looking at things in the perspective of a Financial Counsellor like I had a client come to me that wanted bankruptcy and of course I couldn’t give you the information but in my head I was processing how it would all work, because we’ve done bankruptcy in the course. So when I spoke to our Financial Counsellor about the matter, I was able to understand the process and in this case, was able to identify that there are other and sometimes more suitable options. This is what we’ve learned in the course, and it has practical application to my own work. It’s also helped me to see a lot of the consumer issues that come through the NILS process, in a different way. I think the course has been really helpful in lots of ways. Even when we started the course, we did the Financial Literacy Skill Set units and I had done these units in a different course, but in this course – there was just a whole different spin on it, and I took much more in because of being able to do the units in a face-to-face setting, as opposed to when I had done them online, which I found really hard. But to have it there in front of you in our program now, is much easier because you’ve got other people in the class to bounce ideas off and brainstorm with. I think I learned much more from this, than the online one. Have there been any personal benefits for you, in taking this course? I think for me personally, I’ve sometimes in the past felt a little bit displaced from my culture, because my Grandmother didn’t speak about it very often. For me, the friendships I’ve made in this course – they’re like my family now, and I’ve learned from them – things about my own culture and I really feel included in this group, which I think is really awesome! They’ve been really supportive, for instance, in the last block [face-to-face training] we had, I had a really hard time because I lost my husband two years ago and it was the anniversary of that during the block. The other students were really supportive, they gave me a card. I felt really humbled that they did that. It’s been awesome because we all understand each other. You really feel at home in the class, because it’s your own mob. So even though we’re from different places across Australia, I feel like we’re all one big mob, one big family. Student participants of the Mentorship Program are expected to graduate in mid-2019.